Innovation is now at the stage the quality movement was in the 1960’s. Many leaders of businesses and organizations are aware that their future growth and survival depends on innovation in products, business models and even management systems. But few are aware of what it takes to implement and sustain breakthrough innovation. We now have the answer—irrespective of whether we are a large global corporation or a small business focusing on a local market. Vern Burkhardt (VB): You have written a number of books, including Rethinking the Future, which is published in over 20 languages, Rethinking the Office, Revolutions at Work, and your most recent book, Innovation to the Core: A Blueprint for Transforming the Way Your Company Innovates. If you were recommending one of your books as a must read to our IdeaConnection’s readers which would it be and why? 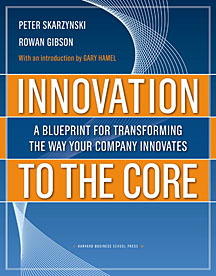 Rowan Gibson: My choice would have to be the new book, Innovation to the Core, which was published in March 2008 by Harvard Business School Press. To my knowledge, it does what no other book has ever done: it gives companies a practical guide to building an enterprise-wide innovation capability. Now, if you think about that, it’s quite a big deal. It’s analogous to what W. Edwards Deming did three decades ago when he described how to turn manufacturing quality from something ethereal into the systemic organizational reality we now call TQM. In other words, this is the first book that really describes how to turn innovation from a buzzword into a deep, sustainable core competence. My co-author, by the way, was Peter Skarzynski, CEO of Strategos, the Chicago-based strategy consulting firm that was co-founded by Gary Hamel. VB: In addition to your own books and articles, what other books or articles about innovation and creativity would you recommend? Rowan Gibson: Until now, most of the books on innovation have been about developing your own creativity as an individual, but not necessarily as a company. So we’ve had plenty of books along the lines of A Whack on the Side of the Head, which is OK if you want to be an inventor or an entrepreneur, but they’re not very useful if you’re running a global corporation with tens of thousands of people and you want to push up the organization’s innovation performance in a serious way. Beyond this, there are books that have tried to address the need for creative thinking as a group. Edward de Bono introduced us to his lateral thinking methodology back in the 1960s, and more recently, we’ve had books on creative brainstorming like Tom Kelley’s The Art of Innovation. But, again, the issue today is not how to play creative thinking games. It’s not about coming into the office dressed as “Innovation Man”, wearing one red sock and one green sock. The issue is: how do we drive innovation to the core of this organization? How do we make it a part of our DNA? And very few books, if any, have really attempted to address this issue. One of the only books I would recommend is Strategic Innovation by Nancy Snyder, which recounts how Whirlpool, the global appliance manufacturer, has succeeded in embedding innovation as a core competence in their organization. VB: In your 2007 article “Winnovation: How Companies Can Stay Forever Young” published in Management Today you state “the only real source of renewal and growth for businesses in the longer term is deep, strategic innovation”. Is that the reason you refer to the “new innovation economy”? Rowan Gibson: Yes. It used to be that you could grow your business in the long term based on a competitive advantage like quality or low cost. But those advantages are no longer sustainable, in the sense that most companies today can offer their customers quality and low cost. These capabilities are almost commodities. So the only real differentiator we have left is innovation. Take Apple, for example. What is it that accounts for Apple’s phenomenal success over the last decade? Clearly, it’s not about making a better computer for less money. It’s about breakthrough innovation, both at the product level (think: iMac, iPod, iPhone) and, more importantly, at the level of the core business model (think: iTunes and Apple Stores). The same goes for Nintendo. The company’s current economic engine—the Wii game console—is not about offering customers a bit more quality here and a slightly lower price there. It’s about deeply and strategically reinventing the gaming experience. Wii is quite literally a “game-changer”. Right now, the product is outselling Sony Playstation and Microsoft Xbox by a factor of 3 to 1. So if we look at all the companies that are creating most of the new wealth today, we find that they are doing it through strategy innovation, not through cost-cutting, downsizing, reengineering, buying back their own shares, mergers and acquisitions, and so forth. It’s strategy innovation that gives winners a wealth-creating competitive advantage that rivals find very difficult to replicate. And it’s strategy innovation that enables winning companies to continually re-imagine themselves in a world of hypercritical change. That’s why I believe it’s appropriate to talk about a new, innovation-based economy. VB: In Innovation to the Core: A Blueprint for Transforming the Way Your Company Innovates you provide a very comprehensive blueprint for making innovation an integral and sustained part of a company. What would you advise is the most important message among the many key messages that business leaders should take away after reading your book? Rowan Gibson: The most important message is that it really is possible to boost your company’s innovation performance in a dramatic and enduring way. Most business leaders want that to happen—they recognize the innovation imperative—but they simply don’t know how to go about it. Very few of them have any model in their heads about what innovation looks like as a systemic capability. There’s just a widespread lack of knowledge about the processes, the tools, and the mechanisms that are critical for making innovation happen. To illustrate this, if you ask business leaders where quality comes from, they can usually talk at length about Total Quality Management. However, when you ask them where innovation comes from, their answers tend to become fuzzy and vague. It’s like asking them where to find El Dorado or the Holy Grail. So the key message of the book is that innovation is not a mystery anymore. We now know how to embed it as an enterprise capability, just like any other major capability in a large company—supply chain management, customer service, quality, and so on. This is not a new management theory or an educated guess. It’s management science, based on a market-proven model for innovation embedment which has actually been used successfully by organizations all over the world. So business leaders at last have a detailed blueprint for turning innovation from rhetoric into reality inside their organizations. VB: Innovation to the Core provides extensive and useful advice about implementing a successful innovation strategy. Yet you say that you have not cracked the code on innovation and there is still much to be learned. What are some of the questions still remaining to be answered or studied? Rowan Gibson: What that statement is meant to suggest, Vern, is not a deep lack of knowledge but, hopefully, a lack of hubris. We’ve laid down a blueprint for transforming the way companies innovate, but there’s still a lot to be learned over the next years as more and more companies get traction with these new processes, tools and mechanisms. Let’s also not forget that each organization has its own culture, structure, strategy and so forth. So the way this stuff gets implemented is going to differ from one company to the other. We’re certainly not saying we have all the answers, but I’d like to think the book has made a significant contribution toward advancing the innovation movement. Some of the questions that still remain concern things like how organizations can manage the daily balancing act between the relentless pursuit of efficiency and the restless search for radical, value-creating innovations. This becomes particularly critical when the economy swings upward or downward, and it’s difficult at these times not to go to one of these two extremes. So far, I don’t think there’s a single company that has honed this down to a fine art but there are some very encouraging examples of progress in this regard. We dealt with the issue to some degree in the last chapter of the book, but I don’t think we’re at the point yet where we can begin to talk about business cases that illustrate this in a fairly detailed way. VB: Are you receiving feedback from business leaders you talk to that they are implementing your recommendations—indeed, moving from reading Innovation to the Core, from being an “armchair tourist” to taking steps to make innovation an integral and ongoing part of their business structure? Rowan Gibson: Absolutely. I’m overwhelmed by the passion with which companies and their executives are embracing the Innovation to the Core methodology. After reading the book or hearing me speak at a conference, they often ask me to come and spend two or three days with their organization to immerse a fairly large number of their people in these new innovation processes and tools. After doing a masterclass like this, I always like to stay in touch with the company to see how it is progressing. When they get back to me with an update, it’s usually to tell me that they now have a full-time Innovation Director, they’ve appointed Business Unit Innovation Officers across the organization, they’ve set aside a budget for funding radical innovation projects, they’re aligning all their growth opportunities in a strategic innovation architecture, they’re measuring innovation performance with a new set of metrics, they’re rolling out an IT infrastructure for innovation, and so on. Some of these companies are already at the stage where they are developing a case study based on their own experience. What’s also very encouraging is that this stuff is working inside organizations from all kinds of different industries—from investment banking to paper manufacturing, poultry farming, diamond mining, automobiles, pharmaceuticals, even public service. All of these organizations are on the journey toward what I call “Innovation Excellence”. VB: In your work with many of the world’s largest, most successful organizations have you found cultural or geographic differences in approaches to innovation and creativity? If so, what are some of the potential implications of these differences? Rowan Gibson: Being based in a particular culture can either make things easier or harder for innovation. For example, if I come up with an innovation like Google and I’m based near Silicon Valley, it’s far easier to get access to the necessary funding and talent to commercialize that idea than if I’m based in, say, Russia. As a matter of fact, one of Google’s founders, Sergey Brin, was actually born in Russia. His family emigrated when he was 6 years old. If they had stayed, I think Brin might be teaching mathematics at the Moscow State University today, instead of running one of the world’s most powerful IT companies. Certain national cultures just seem to be more congenial for innovation than others. For example, I would argue that the kind of innovation I’m talking about requires a lot of focus on the customer, and certain countries seem to be well adapted to this—I think especially of the US, the UK, The Netherlands, as well as the Nordic countries. On the other hand, there are cultures that seem to find this more difficult. Germany, for example, where I’m currently based, has a managerial culture that tends to resist the idea of empowering what I would call “front-line innovators”—those employees who are in direct contact with the customer. This is one reason, I believe, why there is very little service innovation in Germany of any significance. If we take some of the countries in Asia, as well as Africa, we find national cultures that generally discourage free, independent thinking. Kids are taught at school to “know their place” and not to question anything; not to hold contrarian views. Look at the way China suppressed the media and would-be protesters during the recent Olympic Games, or the way Robert Mugabe has bullied his political opponents into silence in Zimbabwe. Yet the ability to question established ways of doing things is fundamental to the innovation process, so these cultures make certain kinds of innovation very tough. Then we have the Middle East, which clearly lacks a culture of entrepreneurship, opportunism and innovation at the grass-roots level. Religion certainly has an impact here. If we consider certain aspects of traditional Islamic law, for example, we can see how they affect innovation. Take the Islamic law of inheritance, which inhibits the accumulation of capital. By definition, this keeps Middle Eastern companies very small and short-lived. It certainly doesn’t facilitate the creation of big commercial enterprises around entrepreneurial founders. In fact, the whole concept of the corporation is absent from the region’s legal infrastructure. That’s why the private economic sector in the Middle East is basically negligible. Instead, what we find in the region is that most of the resources are concentrated in a disproportionately-sized public sector. So, yes, cultural differences certainly have an impact on innovation. This is one of the major challenges that companies are grappling with around the world. VB: You make the point that in the USA General Motors has spent more money on R&D in the past twenty-five years than any other company in North America but this expenditure has not led to radical innovation and business success. Nor have we seen better performance in the other major auto makers in North America compared to companies such as Toyota and Honda. No doubt there are numerous reasons but would you point mainly to the corporate structure and to the leadership of GM focusing too much on incrementalism in innovation and a drive for operational efficiencies—rather than on radical innovation in products, services or business models? Rowan Gibson: Companies like GM and Ford are under extreme pressure. They’ve been intensely focused for decades on making operational improvements, but the efficiency gains from these initiatives are steadily decreasing because they’ve already squeezed most of the juice out of the lemon. They’ve also come up against legacy costs with their health-care programs that they just can’t get around. Add to this the pressure of declining real prices and the bargaining power of today’s customers, and it’s no wonder these companies have hit a wall. The hard reality is that “incrementalism” is not going to solve any of these problems. Companies can no longer hope to significantly grow revenues by coming up with a slightly improved version of the same old thing and then selling it to the same old customers through the same old channels in the same old way. If you’re in a mature industry, the only way to meet radical top-line growth targets is by stimulating demand with products, services, or business models that are truly radical. And when did we last see a major market success story from GM or Ford that was based on radical innovation? In Ford’s case, it was probably the Model T! Now things are so bad that Detroit’s big three automakers have gone cap in hand to the US government seeking a $50 billion bailout. Last year, British Airways even discontinued the daily flight between London-Heathrow and Detroit that they’ve been running for decades. I mean, nobody even takes these guys seriously anymore. What organizations like GM and Ford have consistently failed to understand is that, at the macro level, productivity has always been determined by two elements. On one side, it is determined by the efficiency with which companies use their inputs—how much labor and capital it takes to produce their goods and services. On the other side, productivity is determined by the value that customers place on the outputs. For most of the industrial era, the predominant focus was on efficiency as opposed to value. Yet when we look at the companies that are truly winning today, we find that they are not doing it by eeking out the last few percentage points of efficiency from their business processes. They are doing it by creating things that bring incredible new value to customers. Think about BMW or Porsche, by way of contrast. What we find is that, while these companies are highly efficient in their operations, they do not necessarily enjoy the largest economies of scale. It’s their ability to deliver value—to create things that are compelling, exciting and wonderful—that has made them enormously effective engines of wealth creation. BMW and Porsche, for example, command the highest margins per vehicle in the world. Contrast this with the meager performances of GM and Ford and we find that huge economies of scale do not per se deliver an advantage. If a company is not capable of combining low operating costs on the one side with high value-creation on the other, it simply becomes incredibly efficient at making the kind of products customers don’t want. On the whole, large companies have spent about a hundred years building a “hyper-efficiency” mindset into their organizations. But, until recent years, they have given very little thought to the other side of the productivity coin—how to build a mindset around creating “hyper-value” for the customer. That’s why innovation goes so much against the grain in most companies. It has to fight against a whole set of management principles, processes and systems that are basically set up to deliver something else. Now more than ever, though, organizations need to learn how to be both highly innovative and highly efficient at the same time. In a value-based economy, companies must be able to continually dream up products and services their customers wouldn’t want to live without, yet they must simultaneously have the capacity to deliver those things with brutal efficiency. VB: Can large companies such as Microsoft survive and remain competitive in the coming years if they don’t radically change their business model of developing and selling software—given pressures such as open source and the increasing view of many that “information wants to be free”? Rowan Gibson: I’ve spent time with Microsoft, and they know full well that they’re under attack. Look, Microsoft has been hugely successful with its legacy business model, which is based on making very complex, interoperable programs with millions of lines of code and then selling them to the customer in shrink-wrapped boxes under license. But the evolution of the software industry did not stop with the creation of Microsoft’s business model. Google, for example, makes software that is delivered through free Web-based services rather than in packages you buy in a computer store. Further, Google’s free search software captures valuable attention that advertisers are willing to pay big money for. And now we have services like Google Docs and Google Spreadsheets that represent a direct threat to the margins Microsoft earns from Windows and from its Office productivity suite. This is why the company has been investing billions of dollars to make the shift into online advertising. CEO Steve Ballmer recognizes that this is the new paradigm. He aims to make digital advertising account for about 25 percent of Microsoft’s business within a few years. That’s what the whole Yahoo takeover bid was all about; it was an attempt to muscle into the online market and steal ad revenues from Google. Another big challenge to Microsoft, as you mentioned, is open-source software. Let’s say, for example, that you’re responsible for IT in a large company—or a government institution—and you’re considering options for your programs and infrastructure. Linux is free; Windows costs you money. Linux can be modified; Windows is set in concrete. Linux releases hundreds of upgrades to the operating system in the time it takes to get one “new and improved” version of Windows. Did somebody say, “no-brainer”? You don’t have to be Steve Ballmer to see that the cute little penguin from Finland is a colossal threat to Microsoft’s core business model. Then there’s the ever-present irritation that, despite having a tiny 2.5% market share, and a fraction of Microsoft’s $6 billion annual R&D budget, Apple still manages to produce arguably the world’s best personal computer operating system—Mac OS X. And how do they do that without having a massive army of programmers like Microsoft? Here’s the answer: the core software code behind Apple’s operating system is UNIX—it came out of the public domain. Apple merely puts their own “skin” on it—that unique Apple look and feel that makes it appear so wonderfully cool and easy to use. If Apple had chosen to develop MAC OS X completely on their own, entirely from scratch, the costs would have been astronomical—not to mention the impossibly long timeframe it would have involved. Instead, they chose to be innovative where it matters—in things that add unique Apple-type value—and source the rest from outside the organization. Again, it’s a different kind of business model that fundamentally challenges the way Microsoft does things. If large companies like Microsoft want to survive and thrive in years to come, the critical issue will be deep and continuous strategic renewal. And the fuel for renewal is innovation. It’s not going to come from anywhere else. VB: You say that radical innovation doesn’t necessarily mean risky investments. Would you talk about that? Rowan Gibson: Over the years, innovation has sometimes suffered from a crisis of credibility. Too many companies have been too willing to make big, risky bets on stupid ventures. So we’ve had billion dollar boondoggles like Motorola’s Iridium project, or the failed dotcom grocery business, Webvan. Risk is determined by four factors: the size of the irreversible and non-recoverable financial commitment that must be made to get the project off the ground, the degree to which the new opportunity departs from the company’s existing base of technical and market understanding, the amount of irreducible uncertainty surrounding critical project assumptions (particularly with respect to the nature of customer demand and technical feasibility), and the time frame required for ramp-up (the longer the time scale, the higher the risk). These are factors a company should take a deep, long look at before deciding to bet the farm. In fact, my advice would be not to bet the whole farm on one big opportunity unless it’s a very, very sure thing (like Nokia’s decision to get out of making TVs and rubber boots and focus exclusively on mobile telephony). It’s usually better to take some of the pigs, or even the piglets, and spread them across dozens and dozens of small-scale, break-the-rules experiments. This is what venture capitalists do. They look for opportunities that don’t need a lot of cash to get started. They also spread their investments across a diverse portfolio of opportunities, knowing only too well that most new ventures will fail but that one or two will pay off big time. So that’s one way to spread your risk. Another way is to hedge some of your bets. Use small-scale experiments, pilots and investments to take up flanking positions in technologies, markets or channels that could be critical to your success in the future, but whose actual manifestation is still unclear. A third option is to share innovation risk with strategic partners. When Virgin launched its financial services business, Virgin Money, it relied on an Australian insurance company for the majority of the initial capital and on a British bank for back-office support. In some cases, your strategic partners may even be your competitors. For example, when investment or technology hurdles are high, or where there is a risk of ending up on the losing side of a winner-takes-all standards battle, it often makes sense to join up with other, like-minded competitors in a coalition. The conventional wisdom about innovation is that companies should be less risk-averse. I believe, instead, that the challenge is not how to take more risks but how to de-risk radical innovation opportunities. VB: You cite a number of companies as having successfully implemented innovation structures, such as Procter and Gamble, CEMEX, Whirlpool, 3M, Apple, Google, BMW, W.L. Gore, GE, and Steelcase. Are you encountering an ever-growing number of businesses and business leaders who understand the critical need to make innovation a systemic enterprise capability? Rowan Gibson: Most CEOs used to look at innovation like kind of a sideshow; nice to have, and nice to talk about, but not doing very much to contribute to growing the business. Now the penny is definitely dropping that innovation is not a sideshow, it’s the show. For a start, the companies you just mentioned are getting a lot of publicity for their new innovation structures—and, more importantly, for their dramatically improved innovation performance—so other corporate leaders around the world are sitting up and taking notice. P&G, for example, has been the subject of countless innovation articles in the business press that describe exactly what the company is doing. And the CEO, Alan G. Lafley, recently published a new book called The Game-Changer: How You Can Drive Revenue and Profit Growth with Innovation. If you look at P&G’s organic sales growth since 2000, when Lafley took over, it averages about 6 percent. Now, virtually all of that sales growth has been driven by innovation. They spend just over $2 billion on innovation each year, but they get back over $76 billion in new revenues. Companies like P&G and others are demonstrating that innovation truly can become a broad-based enterprise capability, and that managing and mastering innovation as a disciplined business activity can help an organization reap dramatic financial rewards. So, on the one hand, we have these impressive innovation champions and their equally impressive financial results that are very much in the public eye. And, on the other hand, we have all these business leaders today who are desperately looking for a way to drive aggressive top-line growth in their own organizations. Put two and two together and it’s easy to see why executives are increasingly turning to “all-the-time, everywhere innovation” as their new business mantra. VB: Despite the huge challenge, building a deep, systemic capability for innovation is now the inescapable imperative for every company. Do you hold out much hope for the survival of those that don’t understand and act on this message? Rowan Gibson: No. I don’t hold any hope at all. In a world of hyper-accelerating change, hyper-competition, rapid commoditization of products, services and capabilities, and unprecedented customer primacy, either companies learn to drive innovation to the core by making it a deep enterprise capability, or they risk becoming footnotes in the history books. Simply put, where there is no innovation, there is no growth and there is no strategic renewal. And when companies stop growing and renewing themselves from year to year, they start to die. VB: You talk about the “innovation movement” and you draw comparisons with the quality movement in the past, which also required a comprehensive program and not mere dabbling on the margins. Some of our IdeaConnection readers may be thinking this message is important only for large, global corporations. Do you have the same message for small businesses, even those that focus only on a small, local market? Some very small firms might not relate so well to the quality analogy, especially if they’re not in the manufacturing sector. But they quickly understand the comparison to other organizational capabilities, such as supply chain management or customer service. These are things they have already learned to master. When Tom Peters wrote about being “Close to the Customer” in his first book, In Search Of Excellence, his message was embraced not just by 70,000-person global firms but also by the tiniest little companies. What he was preaching was that customer service had to become a way of life for every organization, regardless of its size. What I’m preaching—and hopefully teaching, through my books, articles and masterclasses—is that innovation is just the same. VB: You say that the innovation process is little understood—the type of idea that alters customers’ expectations, reinvents the cost structure in a whole industry or redefines the basis for competition. Does it surprise you that innovation still appears to be a bit of a mystery to many business leaders? Innovation to the Core: A Blueprint for Transforming the Way Your Company Innovates is a must read for business leaders, entrepreneurs, employees and anyone else who is interested in creativity and innovation. Don’t wait until next week’s interview to get a copy and start reading it. 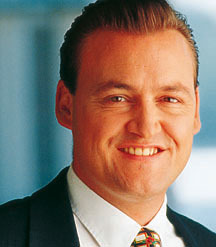 Rowan Gibson, who currently resides in Dusseldorf, Germany, is a global business strategist and an expert on radical innovation (www.rowangibson.com). As a consultant he shows organizations how to seize new growth opportunities, create new markets and transform around the paradigm of innovation. Rowan energizes audiences in Europe, North America and Asia as a keynote speaker with big-picture insights, observations and fresh business thinking.